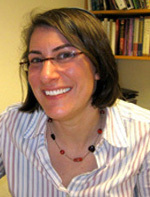 Rabbi Michelle Fisher is the Executive Director of MIT Hillel, a job that now synthesizes her two academic courses of studies. As an undergraduate at Princeton University, she majored in chemistry. She then entered a PhD program in Organic Chemistry at MIT. After telling her MIT advisor the day after she passed her oral exams, that, “Yes, you heard correctly, I just said I want to go to rabbinical school; no, not medical school, rabbinical school,” she completed her Masters thesis, and received a Wexner Fellowship to study at the Jewish Theological Seminary in NY, from which she received her ordination in 2002. Before returning to MIT in her current role, Rabbi Fisher served as the Associate Rabbi of Congregation Har Shalom in Potomac, MD and the rabbi of Congregation B’nai Shalom in Walnut Creek, CA. She also served as a Naval Chaplain Candidate, ministering to Jewish and non-Jewish sailors and Marines.